The winners of the 2018 International Awards for Powered Access (IAPAs) have been announced. The most prestigious awards in the powered access industry, the awards celebrate best practice and excellence in the industry. This year’s awards ceremony was held in Miami, USA on the 8th March. This year’s winners included US business United Rentals, who won Access Rental Company of the Year and French business Haulotte, which won the Contribution to Safe Working at Height Award for its ACTIV’Lighting System. 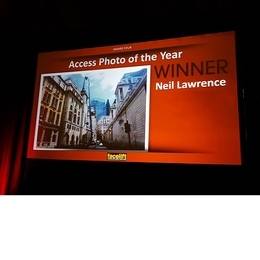 Facelift sponsored the award for the Access Photograph of the Year, which was won by Neil Lawrence of Orion Platforms for his picture of St Margaret’s Church in the City of London UK. Equipment supplied to the National Trust in order to inspect all the lead work on the spire of the Sir Christopher Wren-designed church.